We invite you to join us on this Magic of Flight adventure in the cockpit on the amazing Airbus A350XWB, the most advanced commercial airliner currently in operation! Our flight routing of ADD-JRO-ZNZ-JRO-ADD stops at the top tourist destinations in Tanzania, Kilimanjaro and Zanzibar! The top attraction in Tanzania is Mount Kilimanjaro, the highest mountain in Africa, which you will experience with never before filmed, mountain-top fly-bys onboard Ethiopian Airlines' newest flagship! Welcome onboard Ethiopian Airlines A350-900XWB flight 815 and 814 on an amazing round trip service to Kilimanjaro and Zanzibar! - First ever A350 flight circling Mount Kilimanjaro! - In the cockpit of the Airbus A350-900XWB! 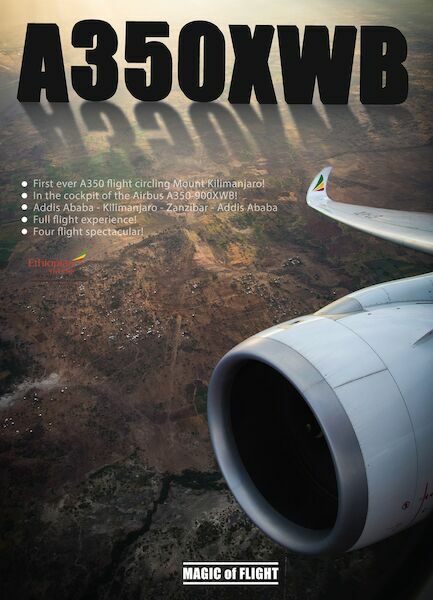 - Airbus A380 House Colors - Addis Ababa-Kilimanjaro-Zanzibar & return - Full flight experience! - Four flight spectacular!